I was looking through Saveur magazine and I saw beef tartare, and thought, I wonder if I could do a take on that using beets? When I went back to look at the recipe with my glasses on, it said BEET. 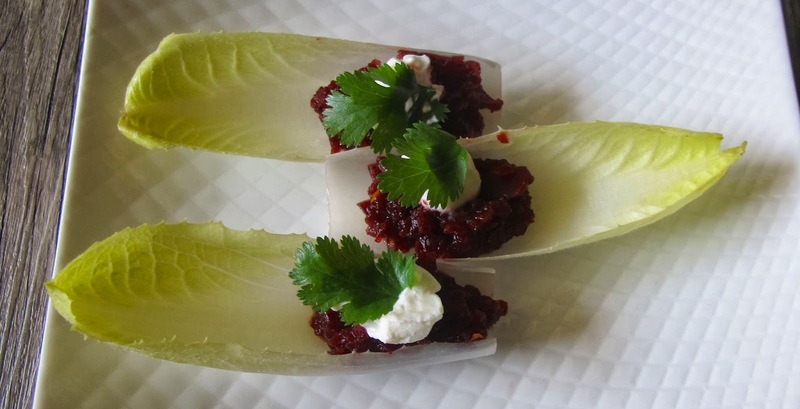 So here is the recipe served on individual endive spears. I think in the future, I would try a dab of goat cheese in place of the sour cream. Coarsely chop beets and add to food processor; pulse until finely chopped but not pureed. Transfer beets to a bowl. Stir in vinegar, 1/2 of orange zest and salt and pepper. Serve on endive leaves with a dab of sour cream, a cilantro leaf, and sprinkle with remaining orange zest.